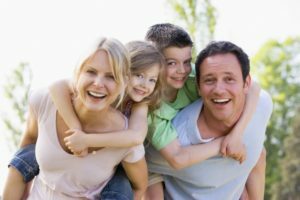 Getting your entire family to their dental visits can be a difficult task, especially if you have a big family who’s always busy. The kids may have after-school activities and older members may not have time due to their work schedules. That’s why your dentist in Tulsa is recommending that families visit during the summer and winter months. During these seasons, your kids have much more free time and other members are more inclined to get treatments done. To find out more reasons, keep reading. When you visit a family dentist in Tulsa, you can expect to get services that help patients of all ages, not just children or adults. Whether you think your child needs dental sealants and a custom-made mouthguard for sports, or you need a nightguard to treat your bruxism, your dentist can handle it. If you’re an older family member, you can get dentures made or relined while another member is getting cosmetic treatment, such as porcelain veneers or teeth whitening. Regardless of the treatment you choose, having them all performed in one location saves your family time, money, and trips around town getting dental treatments done. Another bonus to scheduling family visits in the summer is your recommended second visit of the year lines up perfectly with winter break. Since the American Dental Association recommends all patients visit their dentist at least twice a year, it’s just as important to schedule the second visit as it is to schedule the first. Keep in mind that only dentists can remove the hardened forms of plaque that form on teeth and gums. No at-home oral care routine can match this professional cleaning, so dental visits are necessary to upkeep your oral health. If you want your kids to continue visiting the dentist once they move out, it’s key that you show them how important you consider regular dental visits to be for their oral health. Those who understand the importance of regular dental visits at a young age are far more likely to visit the dentist on their own. Children are particularly vulnerable to tooth decay not only because they’re more likely to consume sugar, but also because they may have issues practicing their oral habits initially. The earlier you can get a schedule built around regular dental visits, the more accustomed they’ll become to visiting twice a year and honing their oral care regimen. Keep your family’s oral health in check with regular dental visits. Schedule an appointment with your dentist in Tulsa today to get started! Dr. Angie Nauman earned her dental degree in Nebraska before opening her practice in Tulsa. Today, she offers a wide array of services to patients of all ages, making her practice a one-stop shop for maintaining good oral health. To learn more about her services, contact her at (918) 254-8686 or visit her website.